Today was the big race! I finished my third half marathon with a personal record AND finally achieved the goal that I set for myself back in April of 2009 – to be a sub-two hour half marathon runner! As I rehashed the race with my running group partners and with my boyfriend, Mike, who also ran the race, a topic came up a few times that I felt would make for a great blog post – inner dialogue. On a typical long run, I’ll turn off the ipod and have a nice conversation with my running partners, but on a long race where I’m truly pushing my hardest, conversation is at a minimum, and I only have my inner thoughts to deal with. Of course the race by-standers and cheerleaders on the sidelines are entertaining, but in the end, it’s you vs. your mind on these long runs. While my outward demeanor didn’t change much during the race (with the exception of the last mile which for some reason was brutal), my inner dialogue changed from Jekyll to Hyde and back fifty times within those two hours. I started the race at the front of Wave 3, just behind the short and very fit pace runner with the little 2:00 sign. This ‘Little Man’ as I thought of him, would be both my arch nemesis and my best friend during the run; sometimes there to comfort me, other times to remind me that my goal could easily slip out of my reach, and most often, my most fierce competitor. And the only reason that this man with a sign was all of these things is because my mind transformed him into them. I started off the run feeling good. Little Man – I can keep up with you! The first five miles went very smoothly. There were a few short hills, but nothing tough. Around mile 5, a fairly low grade but pretty long hill approached. I took a GU and when the caffeine first hit me my body filled with adrenaline and I felt kind of odd. I mistook the feeling for exhaustion and began doubting myself. Could Little Man beat me? I began rationalizing my impending failure– we were in Costa Rica for 8 days so I took 9 days off of running, I got sick three weeks before the race, I wasted energy before the race, etc. Around this time, two girls ran up from behind and were shouting to each other “You can do this! Let’s DO this!! !” and singing at the top of their lungs. Suddenly, my thoughts did a 180. I can do this! In my head I reminded myself of all the reasons I wanted to achieve my goal of 2 hours. I thought of all the people I declared my goal to and how flimsy my excuses would sound to them. I thought of my boyfriend at the finish line, waiting for me to cross before the Little Man. I even thought of my blog! How could I work this hard and NOT do it? I was so close – halfway there now! Miles seven and eight marched by and I was back to loving this little man with the sign. He’s doing me such a favor! All I have to do is keep up with him! I’ve GOT this. Then I reached another hill during mile nine. The little man went from ten feet ahead of me to fifty feet ahead and then farther. I cursed the Little Man. My body ached and my mind whined at me, begging me to stop, and asking me why I put myself through this. 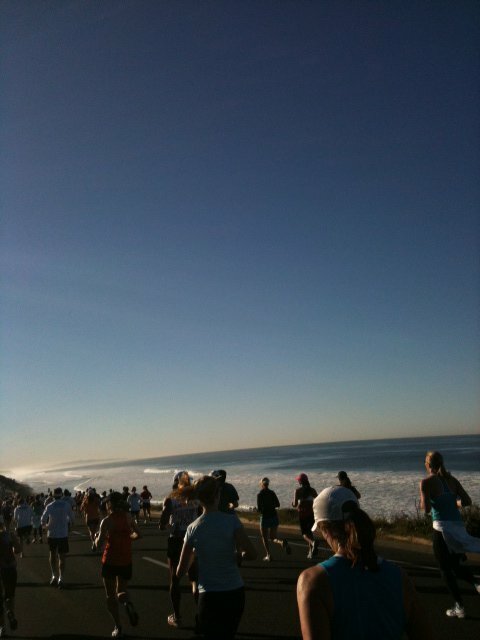 WHY did I want to run 13.1 miles on this beautiful Sunday when I could be laying on the beach? Am I sort of crazy masochist? An aid station approached and I calmed myself down with a GU and a nice leisurely walk to sip my water. I CAN DO THIS! The gap between Little Man and I decreased and soon I was within ten feet of him again. At this point, I realized I had only a little more than three miles to go. Now, that’s nothing, I rationalized. Three miles? I could run that in my sleep! I’m going to do this! Two hour finish time, no problem! I came up with a game plan – to stay behind Little Man until mile 11 and then hit the pavement hard and pass him. Well, mile 11 came and went and Little Man was still ahead of me. Unfortunately, another hill got the best of me and for the first time in the race, I really did think he might win. My breath had been steady the entire race and now it was getting shorter and shorter. The only thing that kept my spirits up was the fact that I knew a downward hill was approaching and I could use its momentum to propel me to the finish. Exhausted, I caught up to Little Man during mile 12. I repeated in my head, ‘you can do this (I even think I may have said it out loud to myself between gasps!). Despite my extreme thirst (we trained in 60-65 degree weather and ran the race today in 70 degree weather), I skipped the last water station because I had to cross traffic to get there. As soon as my Garmin watch told me I had about 6/10 of a mile to go, I booked it. Exhausted, I pushed my body to its limits, repeating in my head over and over again that the race was almost finished and that I had worked too hard to stop now. Eat my dust, Little Man!!! I finished JUST ahead of Little Man, with a final time of 1:59:26. The mind is a tricky thing. They say that as much as 90% of running is mental. Although I don’t know if I’d go that far, it’s fair to say that is plays a significant part. My advice is to set goals and continually remind yourself during the race of how hard you’ve worked to achieve your goal. It’s helpful to tell as many people as possible about your goal – you’re MUCH less likely to give up if you know you have to admit to your entire family, your Facebook friends and coworkers that you failed. However, know that at the end of the day, our bodies don’t always do what we want them to do. Know your personal limits and back off if you have to, but don’t let that devil on your shoulder win. « Getting Ready to BRING IT! I can’t wait to join the sub 2 hour club with you! It will happen. Yes it will!!! I KNOW it will after all this P90X and marathon training! Good luck you two! You’re going to crush it and feel so strong. congrats on your PR for the half! i knew you could do it 🙂 i love the story about the “little man”…so true! For the Conquering the Devil post? The source was my own thoughts! For the rest, I use my own experiences and google what I can’t remember about the workouts.